Some of us have that one irritating HDTV channel that is transmitted via a VHF frequency. All other channels are in the UHF range. I’ve had little success in combining the two into one antenna, mainly because I am on the fringe of reception. 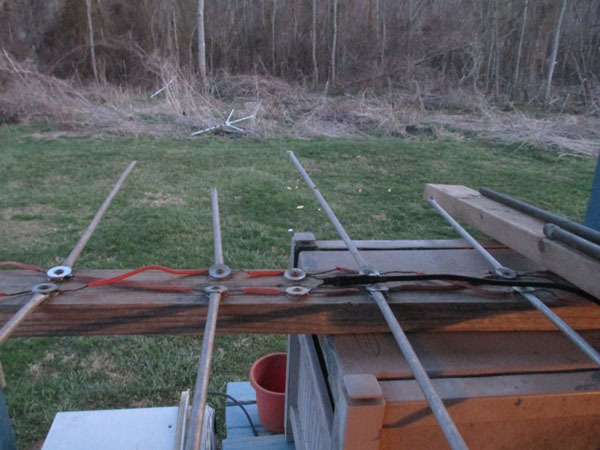 Instead, I have opted to build the VHF HDTV antenna as a mono bander yagi. After several tries I found a winning solution. With the assumption that you already know How To Build An HDTV Bowtie, there will be a modification to this antenna. We will not use coat hangers (I never use them anyhow). I used the elements from an old discarded TV antenna. There will be four sets of elements, commonly called a 4-bay antenna. Note: This is looking at the top end of the antenna. The antenna is resting on top of a picnic table, about 6 feet from ground level. I am using a plastic garden hose reel as a prop. These measurements are for one element on each side. I took a drill and drilled a small hole at the end of each element, as the screws will go through the holes. Then, I tightened the screws down, using two lock washers per element. No soldering was necessary. And of course there is a balun in the middle of the apparatus. It is important to have a metal reflector or backstop behind this antenna. Remember, in order to have this antenna working properly so low to the ground, it will require a metal reflector. This is the key to function. I have some aluminum sheets on the side of my porch. A metal fence would probably work. My target VHF station is 50+ miles away, so I am quite pleased with a 5 bar (out of 10) reception. I’ll definitely take it. As an added unexpected bonus, I get a 3 bar on a local PBS station. Nice, because the PBS station is UHF and my antenna was designed for VHF only. I do have a separate antenna for UHF only. I have two separate antennas with two coaxial cables running into the house. Joining the two different HDTV antennas requires a Coaxial A/B Switch . I toggle between the two antennas. This is the most effective method in my experience. Note: The 2X4 board and copper pipe are there as a weight to steady the antenna. They serve no other function. I forgot to remove them while snapping the photo.